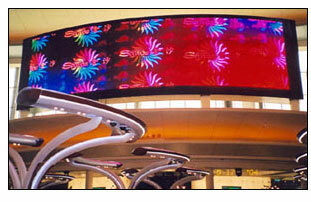 Daktronics Inc., a Brookings, S.D., maker of electronic scoreboards, computer-programmable displays, large-screen video displays and control systems, recently completed the installation of 19 full-color LED displays for the new Las Vegas Sands Casino in Macao, China. Daktronics provided a large curved ProStar display measuring 22 feet high by 82 feet long and 18 smaller curved displays. . . . Lumileds Lighting, a San Jose, Calif., maker of high-brightness LEDs for automotive, display and general lighting applications, announced that the Tokyo-based general trading company Marubeni Corp. will market its LED chip products in Japan, where Lumileds recently opened a business operation. Marubeni will distribute Lumileds' LED chip products to electronics companies that will create 5-mm, 4-pin, surface-mount and chip-on-board LED packages for sale to manufacturers in a variety of industries. Lumileds is a joint venture between Agilent and Philips Lighting. . . . Bob Agnes has been appointed vice president of Asia Pacific sales for Tektronix, a Beaverton, Ore.-based maker of test, measurement and monitoring equipment for the communications, computer and semiconductor industries. He will be located at the company's regional headquarters in Shanghai, China. Agnes was formerly vice president of the company's monitoring and protocol test product line in Berlin, Germany. Before that, he was vice president of its video business and US director of strategic markets for its measurement business. Tektronix has also appointed John Major, former vice president of service, as vice president of its worldwide manufacturing operations.